lifelong commitment to Christ, a potent elixir that would so enamor a child toward God that the child would never walk away from an intense, personal relationship, an epoxy compound that would form a virtually unbreakable bond between a child and God? Such a product would be an instant bestseller in the children’s ministry market! This is, of course, what we desire . . . to lead the children with whom we minister into unwavering dedication to God. Kathleen Chapman, a 30-year veteran of children’s ministry, does not offer a magic potion, an elixir, or an epoxy; rather, she offers a seemingly simple solution to the problem of children “who have grown up sitting in weekly church classes, memorizing Scripture verses, and winning prizes at Vacation Bible School [who] are turning their backs on God” (p. 17). Her solution is “an authentic, biblical worship relationship with God” (p.14). Had she stopped here, the thesis would have seemed somewhat simplistic, possibly even ridiculous, but Chapman carefully articulates the basis of her argument in the course of three chapters subsumed under the heading, “What.” She begins with a more developed explanation of the biblical concept of worship. Citing experts and relying on the work of biblical scholars, Chapman conveys the meaning and use of the word “worship” in Scripture and proffers numerous scriptural references in support of the explanations. She concludes the exploration of biblical worship with an even more forceful re- statement of her contention: “If children spend five minutes a day worshiping and adoring Almighty God, it will become part of who they are and who they grow to be. They will fall in love. It will begin the lifelong process that will for- ever glue them to God” (p. 39). In the two remaining chapters of the “What” section, Chapman seeks to further explain the foundation of the thesis. The most logical of her reasons is, simply stated, that children are naturally inclined toward hero worship. 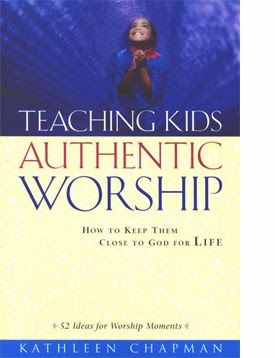 Children, she says, are capable of worshipping something or someone “just because” (p. 42), and she offers stories of the type of one-directional hero worship that exemplify biblical worship/adoration of God. Continuing to explain the “what” of the argument, Chapman posits that it is impossible to worship God if one does not know God. We can begin the application of the glue, she states, by helping children understand who God is, thereby allowing them to become “fascinated by God” (50). In the “How” section, Chapman provides helpful suggestions for implementing biblical worship into one’s ministry. She begins with an explanation of the importance of teaching children about God in language they can understand. Specifically, she focuses on appropriate verbal communication, the use of questions, targeting a variety of learning styles, and the use of child-appropriate Bibles. Chapman next turns to the importance of directing a child’s focus toward God, again offering practical suggestions interwoven with the explanation of the importance of focus. This chapter is followed by one titled “Familiarity,” in which Chapman contends that the secular world understands the importance of familiarity, targeting and engulfing children with specific messages. The church should “learn from their success” (p. 82) and become purposeful in its teaching. The “How” section concludes with a chapter filled with guidelines for the purposeful preparation of a worship program. It is in this chapter and in the subsequent “52 Worship Moments” that Chapman’s experience as a leader in children’s ministry is best utilized. Her suggestions are creative, practical, and serve well the overall assertion of the book. The final section of Teaching Kids Authentic Worship is titled “Why.” The first chapter in this section explores the benefits of worship. Chapman expresses that worship blesses, heals, empowers, provides spiritual protection, brings peace, and ensures purity. She explains each benefit with an appealing intertwining of personal stories and Scripture. The second chapter Chapman offers ideas for 52 worship moments . . . ideas such as worship and light (using flashlights and John 8:12) and worship and sound (using recorded sound effects and Scriptures relating to the particular sound). These ideas are not only imaginative, but Chapman provides sufficient instructions for each idea to be easily implemented. “Dear God. You are the strength of the world. You are the real God. You are the creator of everything. You are love and you are always here” (p. 111). Series 3,Vol. 6, No. 2; Copyright 2009; All rights reserved. Assistant Professor of Christian Education, Lee University, Cleveland, TN. Review edited for DiscipleLand by Debbie Brunet, 2013. Talbot School of Theology is pleased to produce Christian Education Journal in cooperation with the Society of Professors of Christian Education (SPCE). Thank you for this post and book recommendation. I feel like I am on a similar mission as the author, always trying to figure out why some kids hang on to God and some fall away as teenagers and/or in college. I'm constantly thinking about it, praying about it, talking to many college age kids who are on fire for God to try and figure it out. I have 3 young children and I oversee the preschool and kindergrten children's ministry at my church. I am definitely getting this book. I have also looked into the Discipleland curriculum as well. Thanks again! !